The WSCB/P is introducing the GCP2 beginning summer 2019. What is the Graded Care Profile 2? 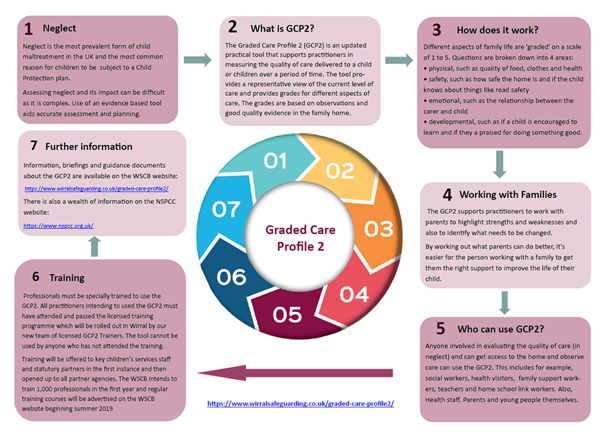 The Graded Care Profile 2 is a tool designed to provide an objective measure of the care of children who are, or maybe suffering from neglect. It is primarily based on the qualitative measure of the commitment shown by parents or carers in meeting their children’s developmental needs. 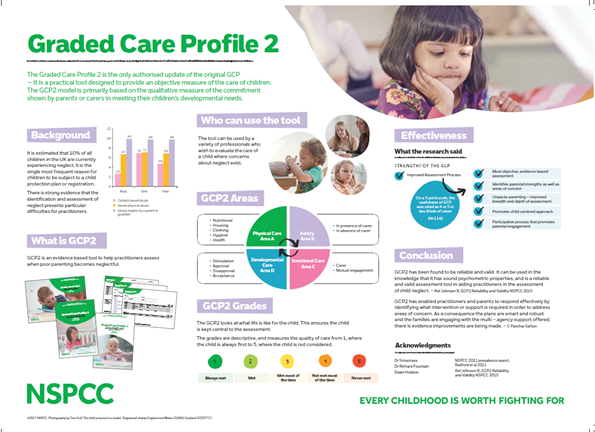 The Graded Care Profile2 has been designed and developed by Dr O Prakash Srivastava a Community Paediatrician. The GCP2 is based on a children’s developmental needs perspective and seeks to measure compliance and commitment to meeting those needs. The original GCP tool was first trialled in 1995 and showed itself to be an user-friendly tool which was reliable and could replicate scores when re-tested by practitioners. The tool has been reviewed and updated and the NSPCC undertook a national evaluation of the tool and found that it was a useful tool and suggested some modifications to enhance it. These modifications resulted in the Graded Care Profile 2. The evaluation report can be found here. 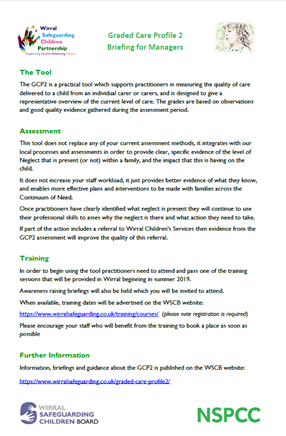 Ensure practitioners in Wirral are able to identify, assess and effectively respond to neglect at the earliest opportunity. What does the GCP2 measure? The GPC2 measures the quality of care given to an individual child over a short window of time (i.e. it represents the current level of care). The care given is graded between 1 (most positive) and 5 (most negative) in all areas of a child’s needs. The grades are based on the extent to which the needs of the child are currently being met and the commitment of the parent/carer to the child in relation to particular areas of care. The areas of care are based on Maslow’s Hierarchy of Needs (physical care, care of safety, emotional care (love and belonging), and developmental care (care of esteem) which are then further sub-divided. 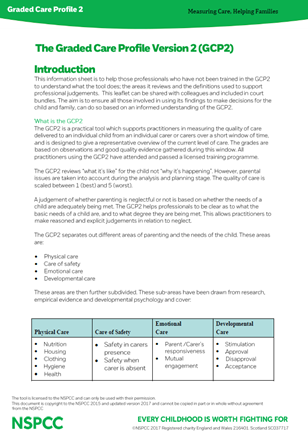 The GCP2 doesn’t explore reasons why a particular level of care is given to a child. However it encourages further exploration of the reasons at the analysis stage and this is supported by the practitioners report and records. The GCP2 will be rolled out in Wirral beginning summer 2019. To support the roll out the WSCB will provide regular full day training courses which practitioners must attend to become accredited to use the GCP 2. Please note that you cannot use the GCP2 without first attending the accredited training provided by the WSCB/P, regardless of whether you attended previous GCP training. This is a requirement of the NSPCC who own the tool. Training courses will be advertised on the website here. Practitioners must register on the website before they can access any of our courses. As well as the training the WSCB will also deliver briefings for staff and on this webpage will provide a range of briefings and guidance documents. Please contact [email protected] if you have any questions about the introduction of the GCP2.